After a dry December, Bay Area residents seem to be embracing the arrival of the year's first rain, and water officials are not yet hitting the panic button on the lack of moisture this winter. They are, however, keeping a close watch on the next three months. 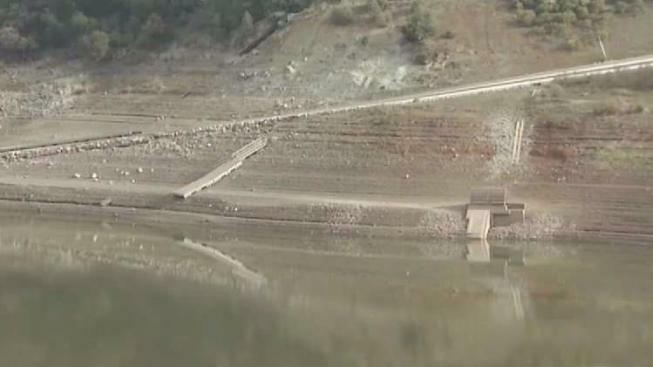 At Anderson Reservoir and Dam in Morgan Hill, the water level is way down from a year ago. The Santa Clara Valley Water District had to open up the dam's spillway early last January because of all the rain. On Tuesday, Anderson was at 26 percent of capacity. One family enjoying a day on the shore of the reservoir would have been sitting several feet underwater a year ago. "I'm really surprised at how low the water levels are," hiker Don Penner said. "But I guess it’s not surprising since we haven’t had any rain." Water district officials say they're not all that concerned. "Not really, to be honest with you. We get most of our rainfall in January through March, so its still very early to call it a dry winter," water district spokeswoman Gina Adriano said. "We’re off to a slow start, that’s for sure." Water reserves are still healthy in the South Bay, despite the low level at Anderson. But the water district will watch the next three months closely. "Oh well, we got so much rain last year," hiker Andrea Patti said. "I’m just surprised it didn't stick around longer." There’s also a potential concern if the next three months bring too much rain, water officials said. A recent engineering study found major issues at the spillways for Anderson, Guadalupe and Calero reservoirs. "The reason they’re classified as hazardous is the population that lives downstream," Adriano said. "So, even though the spillways need some work, they’re not an immediate concern." The repairs on the spillways are currently in the project design stage. Meanwhile, officials are still asking water users to help out by voluntarily conserving by 20 percent, so they won’t have to reach for that panic button.